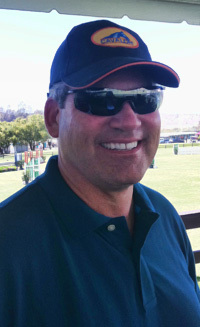 Darren Roberts, originally from Toronto, Canada, has been involved in the sport of Show Jumping since the age of 10. His career with horses began when his family moved to the Bahamas, where he joined the Pony Club. Upon returning to Canada, he was offered a grooming position at Olympic Gold Medalist Jim Elder's training stable. He groomed for many other prominent riders such as Sue Grange, Mark Laskin, and Francie Steinwedell-Carvin. After grooming for Francie for 3 years, he was offered a position as the stable manager. As a stable manager, Darren was responsible for various tasks such as organizing the show schedule, planning tours around the world, schooling horses, and managing staff. He went on to manage for other top stables such as Rocky Mountain Warmbloods, Joie Gatlin Show Stables, and Kinloch Farm. Darren is currently the West Coast Territory Manager for Cavalor and continues to manage tours in Europe and South America for the Canadian Show Jumping Team. Darren Roberts shows you the proper way to bathe a horse with detailed demonstrations of each step while emphasizing horsemanship and safety. Darren Roberts shows you the proper way to groom a horse with detailed demonstrations of each step while emphasizing horsemanship and safety.